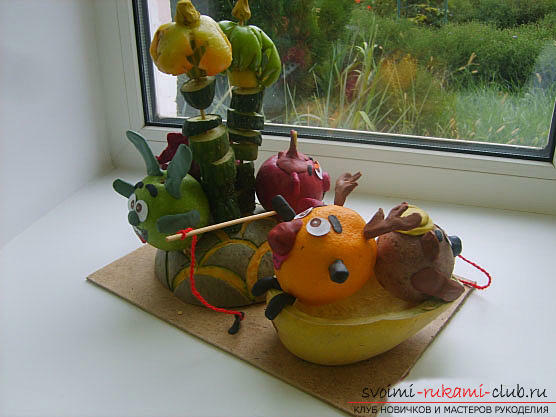 Unique crafts from vegetables in the form of Smeshariki with their own hands, master classes on making smeshariki with their own hands with descriptions and photos. 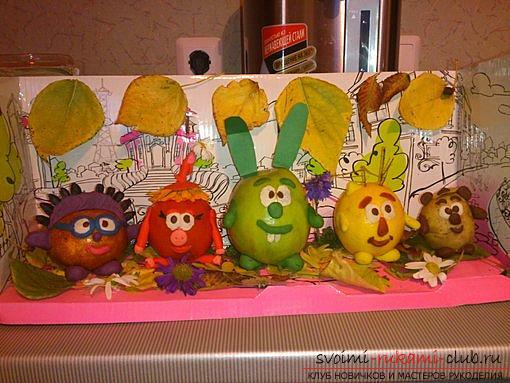 Recently, a special popularitycartoon "Smeshariki", and his characters fell in love and were remembered by many children. Often, a child's child asks parents to buy him such a toy. But if you do not have such an opportunity for one reason or another, then try making smeshariki from vegetables yourself. 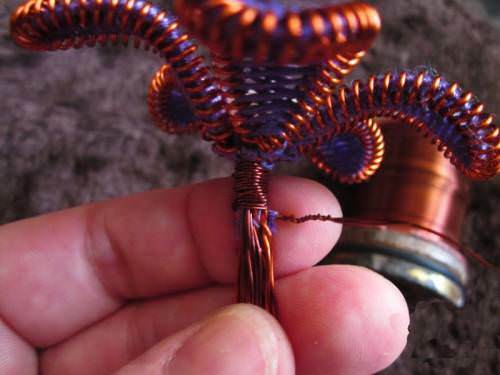 Especially since autumn is the most fertile time for such creativity. Now, as never before, you can buy quite inexpensive vegetables or use those grown in your garden. 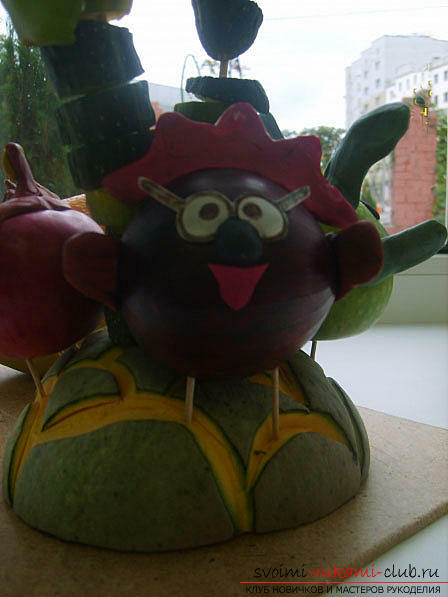 In this article, we will bring to your attention two master classes for the manufacture of crafts-smeshariki from vegetables with their own hands. One of such original crafts can become"Smeshariki on the typewriter." In appearance, these cartoon characters resemble beads, so they are often made from round vegetables. 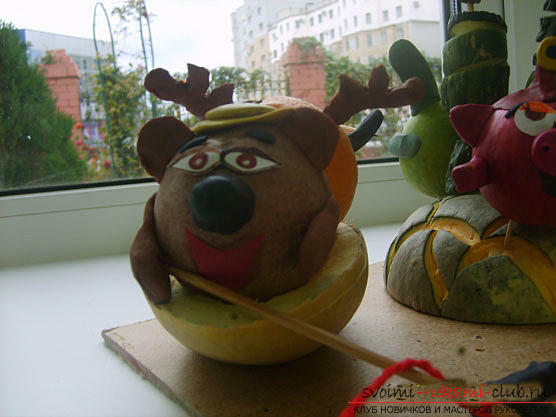 To create Smeshariki yourself, you will need: two eggplants; potatoes; an apple; bow; pear; toothpicks; base board; non-thick plastic; plasticine. Description of work 1. One of the eggplants will be used as an auto, the second - cut in circles and create wheels from it. Using toothpicks, attach the wheels to the machine. We will make headlights from plasticine. 2. The windshield for our car-crafts needs to be cut from a thin plastic bottle, and then attach it to the eggplant. 3. The hero of the cartoon film, called Kopatych (bear), we create from potatoes, and from the bulb we make moose Losyasha, we use apple Nyusha for pig, pear - for Rabbit Krosh. And all the other details (muzzle, ears, horns, hat, pigtail) must be made from plasticine. 4. Using toothpicks, attach Smeshariki to the typewriter. The handicraft is ready! We bring to your attention one more variant of crafts with these heroes, called "Smeshariki on the lake". To create such smeshariki yourself, youwill need vegetables and fruits. And now we will analyze in detail which materials are necessary for the creation of each hero: for Rabbit Krosh: a green apple for making the trunk; for the ears, handles and spout we use the plasticine of a green shade, the eyes and mouth will be made of white cardboard, and after that we will colorize with different felt-tip pens; for the brooch you need a small piece of plasticine black. For the pig, Nyusha will need: a trunk - an apple of red color; for hair, pens, pyatak need plasticine red color; for the peephole, the mouth and the pins, store the same materials as for the rabbit, the mumps bow can be created from plasticine of any color. To create a hedgehog: we need a red apple onion - to make a trunk, needles and pens are made of plasticine of a red shade, the hedgehog's nose is made of black plasticine, and the mouth and glasses are made similarly with a rabbit. The palm, under which there is a rabbit, a hedgehog and mumps, is made from a pumpkin, pepper and cucumber, everything needs to be attached using toothpicks. The trunk of an elk is made of orange; horns fromplasticine of brown color; pens, crooks and legs of plasticine black, and for the spout you need a piece of plasticine red, and the eyes and mouth we'll do by analogy with the rabbit. The torso of the bear is made from potatoes; and ears and hands of plasticine brown color; Eyebrows and nose from black plasticine; We advise to make a hat from plasticine of any color, eyes and mouth we will make by analogy with a rabbit. 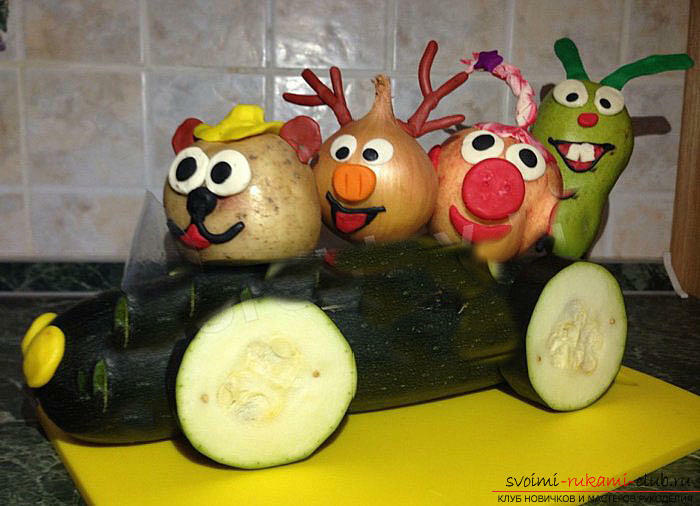 Elk and bear are in a boat, which is made from melon. In their hands, they keep bites that are made of roll sticks. To do this, they need to attach a small thread of any color and quality (in this case, used woolen). Then from plasticine to blind small fishes. 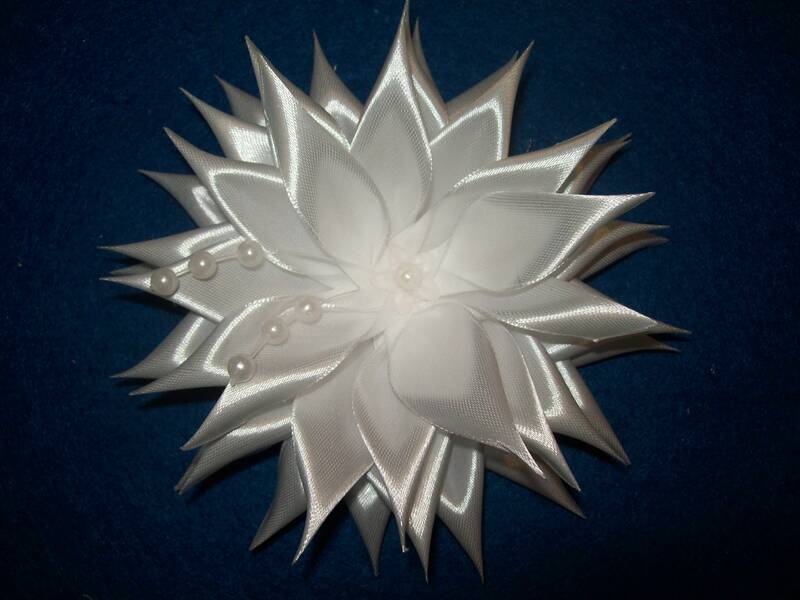 The manufacture of such crafts will contribute to the development of the imagination and fantasy of the child. Greeting cards with own hands, creating Christmas cards with children, two free master classes for making light cards with preschool children.